Freemasons For Dummies: A New Royal Arch Chapter? Yes, Really. 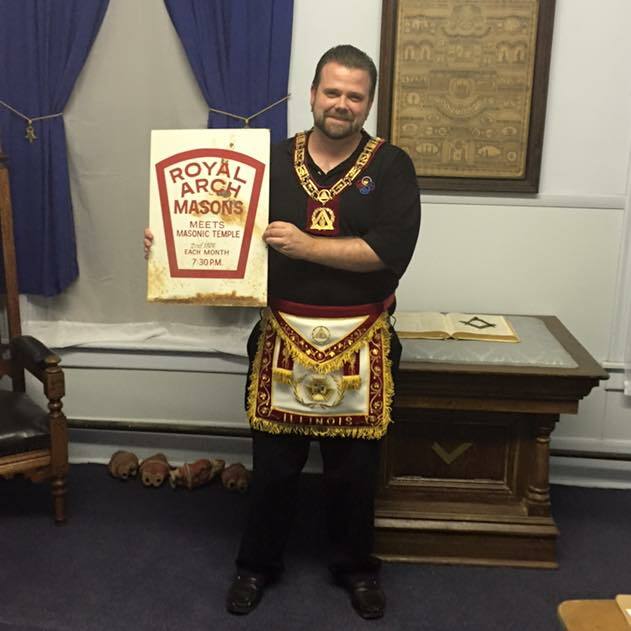 A New Royal Arch Chapter? Yes, Really. Brother Todd Creason, author of Famous American Freemasons, has a short piece over on the Midnight Freemasons site today about something that is rarely heard of in the U.S. anymore - the organization and chartering of a new Royal Arch Chapter. Admiration Chapter in Homer, Illinois is on its way to receiving a charter and redefining what an American Royal Arch chapter might be. In the UK, the Royal Arch degree is seen as an essential and direct adjunct to the Master Mason degree, and it was once conferred in the same lodge. That same attitude was not transported to the U.S., and what we call the York Rite here is not really known in other countries. The York Rite in America is in serious trouble. When the Shrine removed their former requirement that men had to not only be Masons, but also had to go through the degrees of the Scottish or York Rites before then qualifying for Shrine membership, both of those organizations got a swift kick in the pants. The Scottish Rite dealt with this in different ways. The AASR in the Southern Jurisdiction concentrated on creating stacks of new and revived research and study material available for their members, and clung to Pike. The Northern Masonic Jurisdiction feverishly rewrote degrees, and has resorted to presenting more and more on video. But the York Rite did little to respond to the situation over the last dozen or so years. Part of this is simply because of their decentralized, three-body state-wide, AND national, governance system. There is no single organization that directs the York Rite as a whole, which prevents any sort of combined direction or large scale cooperation. In addition, many states have slowly realized that there are just, plain and simple, too many scattered Chapters, Councils, and Commanderies anymore for the number of new members they are getting and keeping. Those individual groups have experienced an even more alarming plummet in active (or even just paying) members than the Blue Lodges have, and only the most dedicated candidates for degrees come back and participate after their experiences. If Blue Lodges have trouble filling their seven-member primary officer lines, Chapters, Councils, and Commanderies are often struggling even worse, partially because they have so many officer stations required, and also because of the increased memory work needed for degrees. I once asked a national office holder in the General Grand Chapter why a Mason should join the York Rite. He didn't tell me about the beautiful degrees or their historic part in the larger picture of Masonry, or even how they affected him personally. He answered, "Well, there's only ONE opportunity to become an officer and Worshipful Master in a Blue Lodge. But there are THREE in the York Rite bodies!" Nobody EVER became a Freemason because they wanted to be a lodge officer. I promise. The degrees of the York Rite are extremely moving. (I happen to think the Order of the Temple conferred by the Knights Templar is the drop-dead, coolest degree in all of Masonry. But maybe that's just me.) They are more personal, in that they are conferred in a more intimate lodge-type setting than the Scottish Rite degrees, and they specifically continue the story thread of Solomon's Temple first encountered in the Craft Lodge. It is a degree system well worth continuing and preventing its extinction. So, Admiration Chapter is taking the tack of making sure business meetings are streamlined, but more important, that they are providing some kind of education or research material at their gatherings. They are trying to make their Chapter more interesting, more memorable, more special, and more enjoyable than what they have seen elsewhere, besides just conferring degrees on men who don't come back. They are stressing quality over quantity. I wish them all the best, and hope they succeed. so what does that mean as far as memory work or does one get in without memory work. There is no actual memory work required for membership in any of the York Rite bodies. It's only if you participate in the degree conferrals. Just one slight correction: As far as I am aware, no Lodge under UGLE also Exalts candidates in the Holy Royal Arch within the Lodge today. These are done by Chapters in Convocations, all of which are affiliated with a Lodge, and carry the same number, but are separate organisations. They usually gather Exaltees from more than one Lodge, those that do not have Chapters affiliated with them. Before the Antient and Modern Grand Lodges were united, the Antients worked the RA degree in its Lodges as the fourth degree of regular Freemasonry, whereas the Moderns worked it separately in Chapters tied to a lodge. After the United Grand Lodge of England was formed, the Moderns method was adopted. There's a lot of info on Wikipedia if anyone cares to take a look. And, of course, the development of the Holy Royal Arch in the United States is to be commended. It is a beautiful ceremony and gives good ritualists another opportunity to develop their skills. Thanks for the correction, Chris. I had misread something a while back or simply remembered incorrectly. The Illinois Grand Chapter has chartered several new chapters recently. Keystone Chapter, which meets at Medinah Shrine Temple, was chartered just last year. Good article. I have always had a fascination regarding the American York Rite system and how it differs from similar Masonic practices in other countries. Though not mandatory, it is a special treat when a presiding officer of a York Rite body can confer all the degrees from memory. Due to an excellent 60 year Masonic Veteran and other MENTORS, I was able to do this, in all York Rite bodies. The Templar Order does indeed have some of the most beautiful work in all of Freemasonry, but as an American Freemason I have long ago became convinced and adopted the predominant British attitude that "The Supreme Order of the Holy Royal Arch" is absolutely necessary for a complete understanding of "Blue Lodge Masonry", and for me, it fulfills what I think many Brothers are searching for in Traditional Observance Lodges. There are many features which make the American practice of the Holy Royal Arch pretty darn special. A couple of them which easily comes to mind is "The Passing of the Veils" (which is no longer a common practice within the British Holy Royal Arch) and the Order of High Priesthood. There are so many gems hidden within plain sight within Freemasonry. For example, the Council (Cryptic Masonry) has one of the best lectures ever written, in my opinion, in all of Masonry. Update: With our conferral of the 7th degree on 3rd December, we have now met the final requirement to receive our charter. The MEGHP was present (he filled in as RAC too), and he stated that he'll be working with our High Priest and Secretary to schedule the charter presentation. We also had the privilege of hosting one of the four Grand Chapter leadership conferences this fall, and our December stated will meet as a table chapter. So the story continues. . . .
Whither 'The Lost Symbol' Movie?